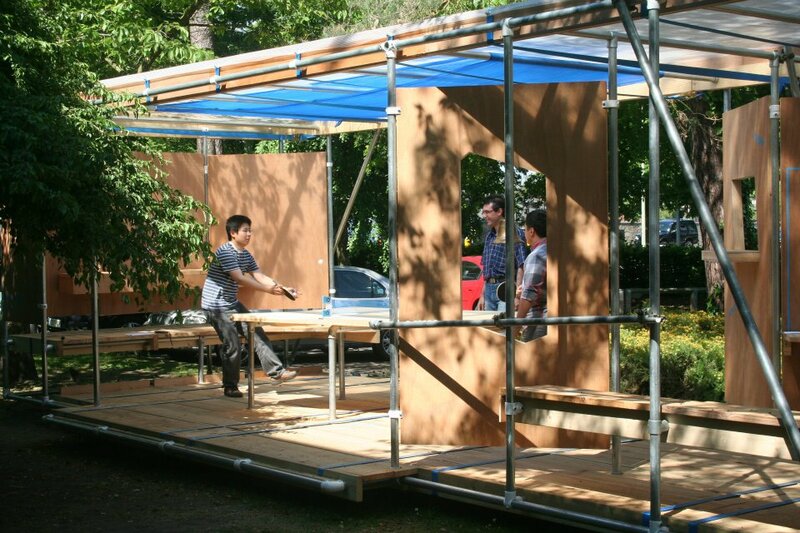 The Play Pavilion competition asked for an interactive and playful installation to feature in the School of Architecture Oxford end of year show on the 25th May, The RIBA’s Love Architecture Festival and the London Festival of Architecture from 23rd June to 6th July. 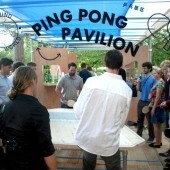 As a response to the LFA’s 2012 theme ‘Playful City’ and the imminent London Olympic and Paralympic Games the entries were encouraged to engage the public in examining spaces for sport. 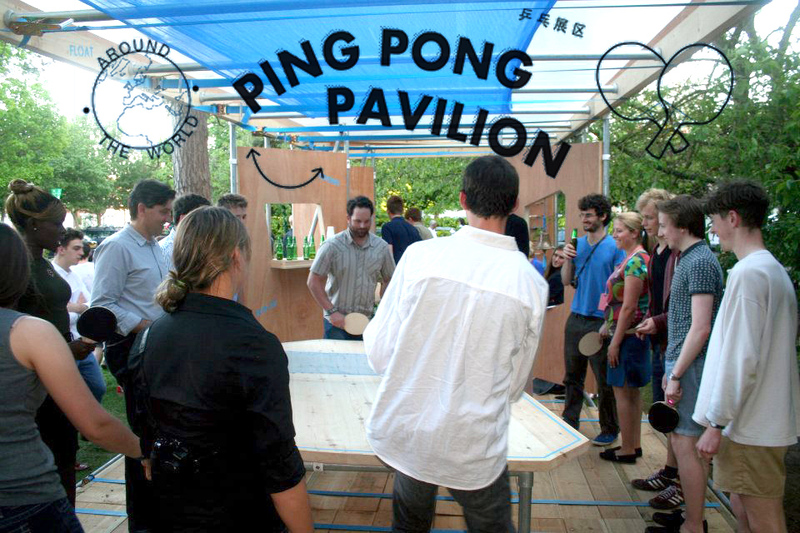 The competition was won jointly by Oxford Brookes’ Daniel Sweeting and Gang of Six Collective, both entering designs for Ping Pong Pavilions. 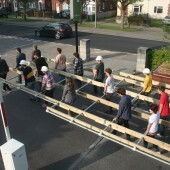 The game was Rundlauf or ‘Around the World’, for 4 or more players; a single table in the right space can host over twenty players in one game. A bespoke dynamic table took centre stage and was surrounded by suspended screens with different situational triggers. A screen to hold 50 paddles, to depict the rules, to provide a practice table, to hang a game bell, a screen for a poseur, to play against, to practise against, a screen to shelter from wind. Social space was designed into the areas created by the arrangement of the screens, with benches and tiered seating to view the play. The project was awarded £3000 funding from the university as part of the ‘Live Projects Pedagogy International Symposium’. 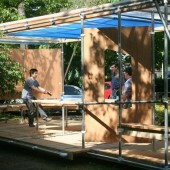 After spending time at the School of Architecture end of year exhibition, the pavilion moved into a residency at the Industi[us] festival of upcycling in Canning Town. This project was shortlisted for the New London Architecture awards 2013. 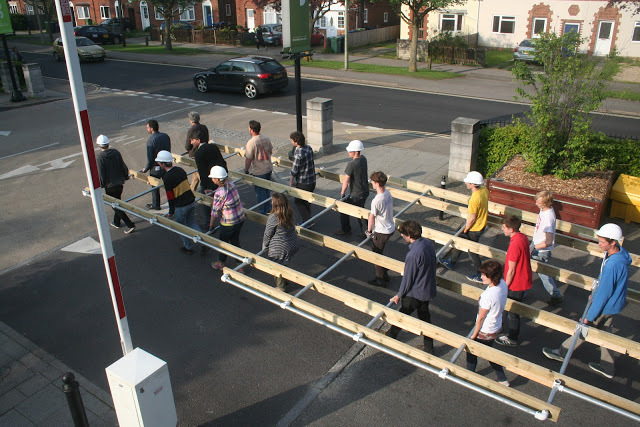 Research Question: Re-interpreting spaces for sport: inclusive design.